During the 8th century BCE, trade was becoming important in the Mediterranean. Greek traders began searching for a means of making a living on the sea, as attested to by Hesiod: "You yourself wait until the season for sailing is come, and then haul your swift ship down to the sea... even as your father and mine, foolish Perses, used to sail on shipboard because he lacked sufficient livelihood." (Works and Days 630-635.) Greek traders explored the west, establishing trading posts in Italy, Iberia, and Africa. They also explored the Black Sea. This generation of explorers was interested mainly in finding natural resources that were scarce in Greece, especially metals. The massive colonization of the 8th and 7th centuries was spurred by excess population and land hunger, as well as political changes in Greece. 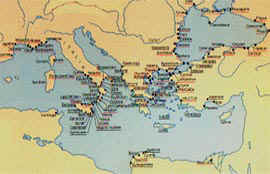 Over two centuries, Greek colonies would be established all over the shores of the Mediterranean and Black Sea. In the 8th century BCE, as iron tools became more common, Greece experienced a sort of agricultural revolution. Iron farming tools allowed more efficient farming, which led to a food surplus and a population explosion. Eventually there were more people than there was arable land for them to develop. This led to land hunger that probably made the confines of the Greek mainland and Ionian coast seem uncomfortably small. Polis expanded until it contacted neighboring polis, and unless it conquered land in war it needed to find another source of farmland for its extra population. Groups of young men were shipped off to far-off places to try to win a place for themselves. If they failed, their home city would be rid of some of its excess population. If the colony was successful, the mother city was similarly reduced in population, and it had an instant trading partner and ally. Often colonies were established in areas rich in grain, metals or timber, allowing the colony and its home city to grow wealthy through trade. The political changes of the 8th-7th centuries contributed to the stream of colonies out of established Greek cities. As Greek cities developed into poleis, which occurred concurrently with Greek colonization, political conflict probably occurred which resulted in some factions losing their political struggle. (Fine, John. The Ancient Greeks: A Critical History. Cambridge: Harvard University Press, 1983, page 77.) Ousted factions might, either voluntarily or under compulsion, be sent off en masse to form a new colony. This may be the real story behind the establishment of Sparta's only western colony, Taras, in Italy. According to legend, the men sent off by Sparta were those conceived while their wives' husbands were away at war and whose legitimacy was therefore in question. The young men later organized an unsuccessful rebellion to win power for themselves (ibid., p. 77). Whether or not this legend is true, it is clear that the young men sent to Taras were political undesireables who could be expended on a foreign colony. The population expansion and quickly changing political situation of the 8th and 7th centuries separated the colonization effort of that period from that of previous and succeeding periods. Some pressures would continue to lead to Greek colonization through later centuries. For instance, Greece would continue to need to import food and resources from other areas. Large city-states like Athens could not grow enough grain to support their population, and grain trade with cities in the Black Sea became increasingly important in the classical period. The mines and forests of Iberia, Italy, and Chalcidice continued to draw Greek settlers, since Greece was not rich in these resources. Athens was dispatching colonies as late as the 430's, when it established Amphipolis in Chalcidice to monopolize valuable timber resources (ibid., p. 370). Although colonization did continue through Greek history, its peak was at the end of the Greek dark age. It was sparked by the overpopulation and political unsettlement of the period and had a great influence on later Mediterranean history.